When it comes to straightening teeth, the treatment needs and preferences of an adult are different from those of a child. At Ward Orthodontics, we carefully tailor our treatment plans to match the needs and preferences of each individual patient. The American Association of Orthodontists states that children should be evaluated by an orthodontist when they are about seven years old. The purpose of this evaluation is to identify problems that should be treated early in order to prevent bigger problems down the road. At this age, the orthodontist can provide early treatment to influence the growth and development of the child’s teeth and jaws. Early treatment is sometimes beneficial to help avoid tooth extractions and correct speech problems. Early treatment can also help eliminate thumb-sucking habits, jaw asymmetries, and popping jaw joints. If your child is having problems with chewing, mouth breathing, or biting, a visit to the orthodontist will be very helpful. Teens are often excited to get braces because it has become quite fashionable to wear braces as a teenager. Braces are available in different colors and styles to make them more stylish and comfortable. Different materials are also used, such as metal or ceramic braces and clear plastic Invisalign trays. The length of treatment usually depends on the complexity of the treatment as well as the individual variation of how each person’s teeth respond to the treatment. 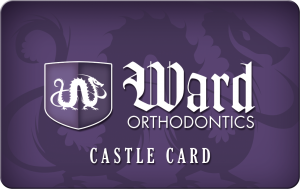 At Ward Orthodontics, we are committed to make orthodontics a wonderful experience for both the patient and the parent. We do everything we can to create a fun, cheerful environment. We understand that modern families often have busy schedules, which is why we make it a priority to get our patients in and out of the treatment chair on-time. Orthodontic treatment is becoming more and more common in adults. According to the American Association of Orthodontists, 20% of orthodontic patients are adults. Most adults get orthodontic treatment to improve their appearance and to maintain their health. Ward Orthodontics offers many comfortable and elegant treatment options for adults, including Invisalign, lingual (behind-the-teeth) braces, and ceramic (tooth-colored) clear braces. We’re determined to give you the beautiful smile you’ve always wanted.